In a perfect world, timekeepers would record their time contemporaneously with the work being undertaken.In the real world, however, where multitasking has become the norm and a decentralized, increasingly mobile work space is common, time sheets are unlikely to show a truly accurate account of the working day. Intapp Time provides superior business intelligence that changes your firm’s fundamental relationship with time. 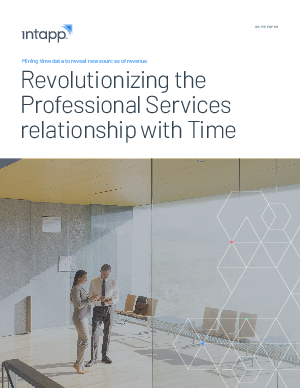 This unified suite of applications gives timekeepers access to time data and capture wherever they are: in the office, on a mobile device, online and offline.It is user-centric, offering a completely automated option while fully supporting hands-on tracking—contemporaneous or re-constructionist. Intapp Time helps your business mine time data to reveal new sources of revenue, inform staff decisions, increase project efficiency, and reduce time leakage. Plus –see how Intapp Time helps your business use historical time data to optimize pricing for future engagements.